It is customary to laud every new Web 2.0 social networking semantic online service as The Next Big Thing. Facebook, Twitter, FriendFeed and friends all get their share of hype and fan fiction. And that’s fine, as some of those sites really have achieved a lot of success and influence. However, sometimes reviewers get carried away by their own superlative eloquence and start claiming that a specific site will top everything else and become the only worthwhile way for people to communicate in the online world. Why, I’ve read such claims about FriendFeed just a short time period ago. Communication is a diverse beast. You might want to contact someone in private or send out a message to a large number of people. You might want a realtime conversation or a long letter or article that you can read at your leisure. Sometimes you might want the intimate in-person experience, and other times a bland just-the-facts report would be enough. There’s a wide spectrum of possible situations and no single technology covers them all (yet). What’s more, we don’t really always know what medium would be best in each particular case. For example, “videophones” were perceived as an obvious next step for remote communication but now that we actually have the technology it turns out we don’t actually want them that much, at least not for everyday use. We’re still exploring the space of possible solutions. It’s obviously much too early to say that a given technology/service/application is perfect – even for one specific purpose. 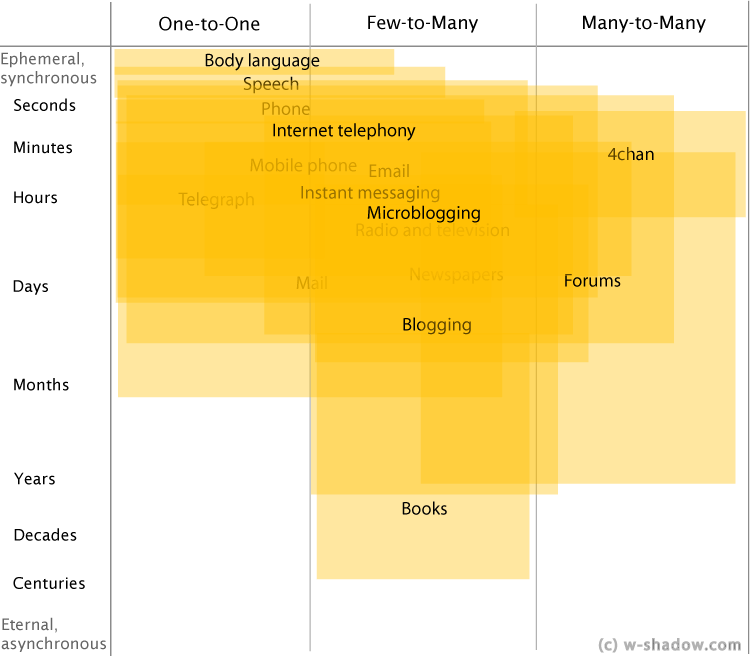 If you’re wondering how the spectrum would actually look like, imagine a multidimensional graph with axes that represent the main parameters of various communication mediums, like average message size, number of people sending/receiving, delivery speed and how long the message stays relevant. Then plot all various the technologies and services – from body language to 4chan – on the graph and animate it along the timeline of our civilization. It would probably make for an interesting presentation. I’d love to point out some of the apparent trends and correlations, but they’ve already been discussed to death by every two-bit futurist out there. Lets just say we’re still only getting started with new mediums. It’s a slow news month! This entry was posted on Thursday, May 28th, 2009 at 23:08	and is filed under Miscellany. You can follow any responses to this entry through the RSS 2.0 feed. You can leave a response, or trackback from your own site. Cthulhu generated this page with 46 queries, in 0.976 seconds.